Scotland's wheelchair curlers will compete in the Danish International Wheelchair Curling Cup 2008, at the Taarnby rink this weekend. Representative teams from six countries will take part, Germany, the Czech Republic, Norway, Russia and Denmark, as well as the Scots. A round robin is planned to allow all the teams to compete against each other. Michael McCreadie, Angie Malone, Jim Sellar and Rosemary Lenton are the team for this event and play their first game on Friday evening against Germany. Aileen Neilson and Tom Killin are the other members of the six member National Squad. At home, the new wheelchair curling Performance Squad has its first training weekend at Curl Aberdeen. Good news is that Ena Stevenson is out of her 'retirement' as Technical Advisor! The Royal Club's Disability Curling Officer Sheila Swan will deliver most of the programme with Ena, and Albert Middler. Curling figures, split timing, new delivery techniques and basic nutrition are in the programme for the ten strong squad: Jackie Cayton, Murray Cran, Jim Elliott, Gregor Ewan, Angela Higson, Gill Keith, David Morgan, Mike McKenzie, Mo Simpson and Paul Taylor. 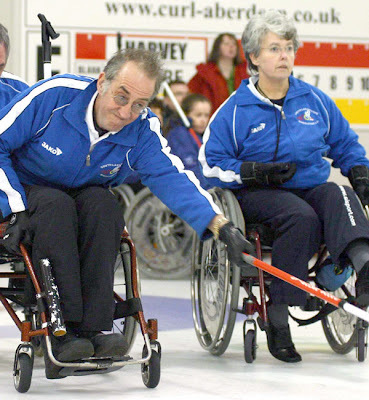 Top photo: Jim Sellar and Rosemary Lenton at the Scottish Wheelchair Curling Championship last season. Pic by Bob.